Take in this stunning island nation on an unforgettable journey to the north, south and west of the country. Take in this stunning island nation on an unforgettable journey to the north, south and west of the country. Marvel at the raw volcanic landscapes, plunge into thermal swimming pools and admire fast-flowing glacial rivers, waterfalls, ancient Viking villages and coastal towns rich in tradition. Just two degrees south of the Arctic Circle, Iceland is one of the few countries where the spectacular Northern Lights can be seen from late August to mid-April and where the summer months deliver 24-hour daylight. Arrive into the Icelandic capital and transfer to your modern boutique hotel in the city centre. Tonight, join fellow guests for a welcome dinner. Spend the day exploring both the contemporary and traditional sides of this cultured coastal capital. Start with a visit to a small workshop, where a local craftsman reveals the tradition of Nordic knife-making, which dates back to the Viking era. Continue to the National Museum of Iceland, which tells the story of Iceland’s founding through some 2,000 objects, including a medieval ship of the type used by early settlers. You then visit Hallgrímskirkja church, the city’s most prominent landmark, inspired by the towering forms of Iceland’s volcanic landscapes. Stop by some Icelandic design shops, and then take a private tour of the Harpa, a cutting-edge performance centre built in 2011 to stage everything from jazz quintets to operas. This award-winning structure features a striking coloured glass façade designed to evoke Iceland’s basalt landscape. Venture out of town to your rustic 52-room hotel in the countryside. After breakfast, embark on a Super Jeep tour through Thorsmork (Thor’s Valley), a vast nature reserve of snowy peaks, jade-green slopes and glacial rivers trickling through dark volcanic earth. In a land already known for its scenic beauty, Thorsmork is a gem among gems, and a paradise for trekkers and photographers. Explore today with a skilled driver-guide, who leads you along the trails and rivers while discussing the reserve’s history, geology and wildlife. Along with the Amalfi Coast and Ireland’s Ring of Kerry, the shore of southern Iceland offers one of the most scenic drives in all of Europe. Spend a morning exploring the enticing coastline, stopping to explore waterfalls, black sand beaches and glaciers. Perched atop two adjoining tectonic plates, Iceland is one of the most seismologically active places in the world; learn how this has shaped the island with a visit to the Lava Centre, where state-of-the-art exhibits reveal the fascinating facts behind earthquakes, volcanoes and other natural forces. By contrast, the Skogar Folk Museum tells a more human story, depicting life in Iceland from the Viking era and through the subsequent centuries. Thingvellir National Park is that rare locale that is significant both as a scenic wonder and a cultural treasure: a UNESCO World Heritage Site where the Vikings established the world’s first democratic parliament more than 1,000 years ago. It’s also one of the few places you can straddle two continents at once, as the conjunction of the North American and Eurasian tectonic plates is exposed here. After exploring the park, continue to Friðheimar, a geothermally heated organic greenhouse, for a tour and freshly prepared lunch. Next, visit the regularly erupting Strokkur geyser and stunning Gullfoss, where milky green glacial water plummets down Iceland’s most famous waterfall. Dine tonight at your sustainable boutique hotel. Begin today’s adventure at Deildartunguhver, the highest-flow hot spring in Europe, which provides heat to villages and towns up to 65 kilometres away. This is followed by stops at Hraunfossar and fabled Barnafoss waterfalls. After lunch, ride in a specially equipped eight-wheel truck on the colossal Langjökull ice cap — Europe’s second-largest glacier — which, at its highest point, sits at an elevation of 1,450 metres. Descend into man-made tunnels carved deep into the glacier, exploring stages of glacial formation, blue-hued dens and even a chapel. Journey to the working fishing village of Siglufjörður, stopping en route at Skagafjorður Heritage Museum, which recreates life on a 19th century estate, even reproducing a village street with a blacksmith and carpenter. Follow this with lunch in quaint Blönduós. The glacial river Blanda flows through this small town, giving it a serene and scenic air. Continue to Hofsós for a dip in a thermal swimming pool, set on a hillside overlooking the sea, and designed by the same architect behind Iceland’s Blue Lagoon. This is one of the most renowned pools in Iceland and is a favourite of locals. Dinner tonight is at your new boutique hotel in the heart of a small fishing village. Icelandic waters are home to more than the game fish that have made fishing one of the country’s biggest industries. There are also some 20 species of whales, dolphins and porpoises swimming off these shores, everything from the small harbour porpoise to the massive blue whale, still the largest animal ever to have lived on the earth. Join an experienced crew of whale- and dolphin-spotters for an extraordinary safari at sea and see how many of these amazing creatures you encounter. Orcas (also known as killer whales) also frequent these waters, along with humpback whales, sperm whales, minke whales and whitebeaked dolphins. Following your voyage, enjoy time at leisure to explore pretty Siglufjörður. In addition to its scenic attractions, the town offers a pair of small museums (devoted to herring and folk music), charming local architecture and several inviting cafés. Venture to Akureyri, Iceland’s buzzy small city on the north coast. Visit its botanical gardens, among the northernmost of its kind and home to over 400 species of native flora. After lunch, explore the beautiful old town on a walking tour. 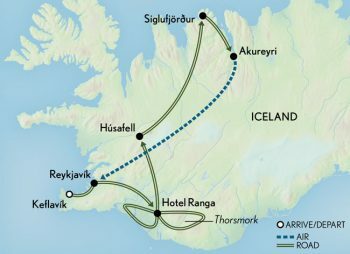 Depart for the airport and fly to Reykjavík, where you check in to your hotel. Tonight, your farewell dinner features traditional Icelandic dishes. Note: A minimum of 4 guests required for this trip to operate.